Cullan received his MBA from the Freeman School of Business at Tulane where he focused his studies on Entrepreneurship and Real Estate Finance. He is currently the Director of Development for a local private equity fund focused on eradicating blight in Mid-City. Cullan has volunteered with multiple non-profits; most recently serving as Vice-Chair of the Gen Y Board for the YMCA of Greater New Orleans. Cynthia recently joined the board in June 2018 as the treasurer. Cynthia works closely with the board and executive director to monitor the budget and report and help maintain the fiscal health of Abeona House. Cynthia is a native of Washington Parish, Louisiana and graduated from Mt. Hermon High School. Cynthia earned her bachelor’s degree in accounting and minor in professional writing from Southeastern Louisiana University. Cynthia has worked as an auditor for Postlethwaite and Netterville since 2014. She holds various industry certifications such as Certified Public Accountant and Certified Fraud Examiner which equip her to serve a wide range of clients such as local governmental entities, non-profits, and for profit companies. Cynthia resides in Covington with her husband of seven years and dog, Google. Cynthia enjoys mastering excel formulas and spending time with her six nieces and nephews in her free time. Vera Lester is a yoga teacher, officiant, and speaker who brings humor and reality to a spiritual way of life. She teaches vinyasa flow and Bowspring classes at Wild Lotus Yoga, and works privately with clients. She is especially passionate about teaching yoga to recovering addicts and alcoholics at Odyssey House of Louisiana. Prior to starting this crazy new life, Vera was a professional fundraiser for several dynamic nonprofits in New Orleans. She’s a proud product of New Orleans public schools, and has always been committed to making an excellent education accessible to all New Orleans families. She’s proud to be “Auntie V” to Max (Abeona alum) and Elizabeth (currently in the Garden Room). 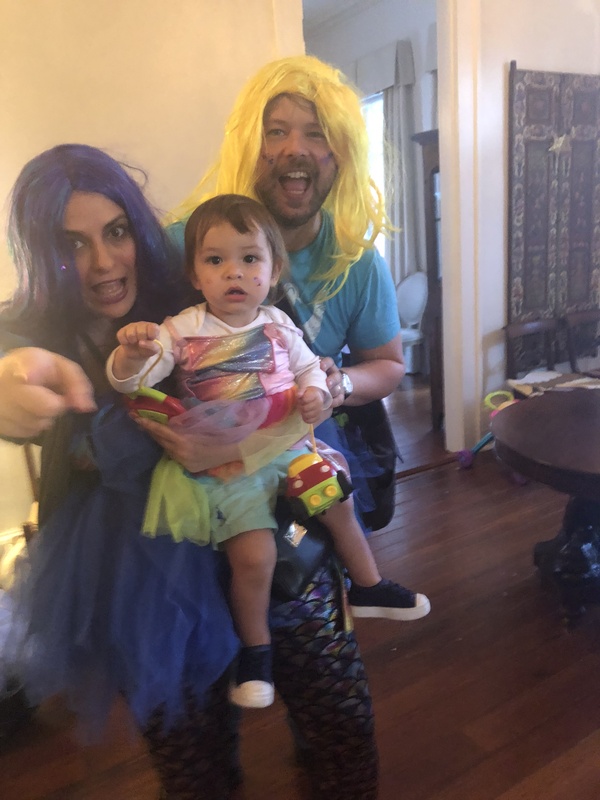 Originally from Sacramento, CA, Erika is proud to be connected to three generations of men who are native New Orleanians; her grandfather, husband, and now 4 year old son Gabriel. After two years of serving as a teacher in the U.S. Peace Corps in Cameroon, West Africa, Erika returned to the states and continued her youth development work in Chicago, IL, where she originally met husband Kodi. In 2010, Erika jumped back into to school to pursue a degree in social work, she received her MSW from Washington University in St. Louis in 2012. Shortly after, Kodi received an offer to teach in LSU’s history department, which brought the couple back home to New Orleans. Currently, Erika is employed with the New Orleans Health Department, where she works very closely with the Mayor’s Office on the City’s violence and murder reduction initiatives. In addition to this challenging work, Erika continues to pursue her passion around youth development through a small but mighty family literacy project. Originally from Brooklyn, NY, Kenny graduated from the University of Virginia in 2011. After graduation, he headed to New Orleans for what he thought would be a two-year adventure as a Teach for America corps member, teaching Kindergarten. However, like many before him, the amazing people and specifically the children of New Orleans became a part of his soul. After his corps service ended, Kenny remained in the city and continued as an early childhood educator teaching Kindergarten and Pre-k at several schools across the city. These experiences taught him the paramount importance that a child’s early educational experience plays not just in their academic development but life outcomes. Currently he is employed as the Assistant Director of School Performance at the Orleans Parish School Board working to build equity in our public school system. Kenny enjoys indulging in all of the great music and delectable food New Orleans has to offer and can be found hosting “Resistance Radio” a podcast that centers of local and state politics. Mercedes Montagnes is the Executive Director of the Promise of Justice Initiative. Mercedes was born and raised in Toronto, Canada and first moved to New York City in August of 2001. A passion for criminal justice reform and love first brought Mercedes to New Orleans in 2007. After graduating from law school and clerking, Mercedes made her permanent home here in 2012. Since then, she has been working with the vibrant community of justice seekers in Louisiana. Mercedes is the proud mother of Hugo in the Beehive and is grateful every day for the love he gets at school.